and we're going to find a good one! I just have to share one of the most thrilling developments in my obsession with children’s books. I’m not exaggerating when I say this truly makes the list as one of the top five most fabulous things that has happened to me this year. 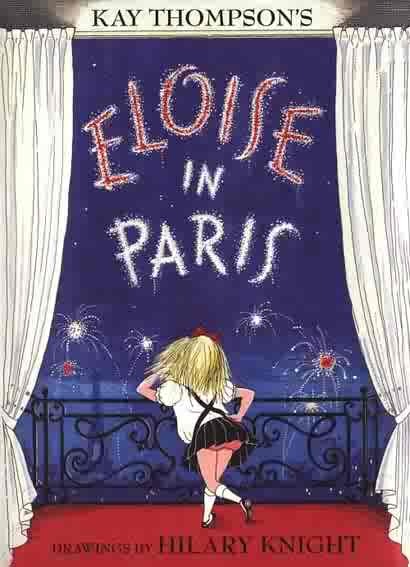 I started my collection of picture books as a high school senior when I picked up a copy of “Eloise in Paris” from the Louvre. I was traveling through France with classmates and, when I returned home, I informed my boyfriend (now husband) that our first child would be a girl named Eloise. Seven years later, that’s just what happened. Since then, my collection has grown to such a degree that no single bookcase can hold it. In addition to the exciting new finds I come across during my many visits to the bookstore, I’ve also spent a great deal of time tracking down favorites from my childhood. Many I dug out of boxes at my parents’ house, but others have required a bit more sleuthing. One in particular has been the thorn in my side for nearly a decade. 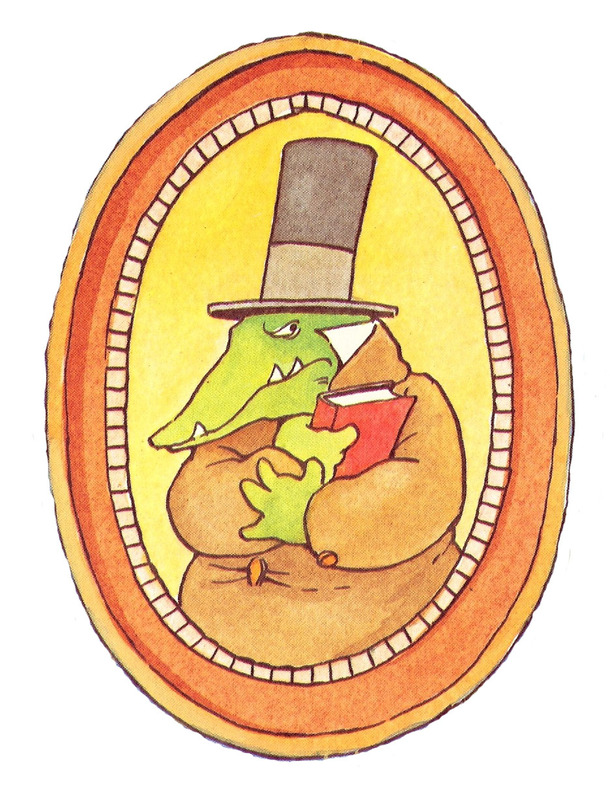 This book was about a grumpy alligator or crocodile who was generally unpleasant with his neighbors. For some reason, he decided to paint his house in vertical, multicolored stripes. I’ve asked nearly every bookseller and librarian I’ve met in the past 10 years about this book. Not one has had the slightest guess at a title. My tireless Internet searches have yielded little other than Lyle the Crocodile titles and non-fiction books about reptiles. I even shelled out $2 and posted a listing on Stump the Bookseller, an amazing online database dedicated to finding long-forgotten books with only the vaguest of memories as reference. After nearly three months on the database, I had nearly given up hope of ever finding the book. And then I happened on a friendly bookseller at Barnes and Noble in the Georgetown district of Washington D.C.
My bubble was officially burst, so it came as an utter surprise when I received the following email the very next day. “I understand that our selection librarian responded to you that we are unfamiliar with the book you are looking for. Although the title doesn’t come to our minds, I will do some sleuthing to see if I can find it. I wanted you to know that we are still looking.” – Micki Freeny, Coordinator of Youth Services. Can you feel my excitement reaching fever pitch? 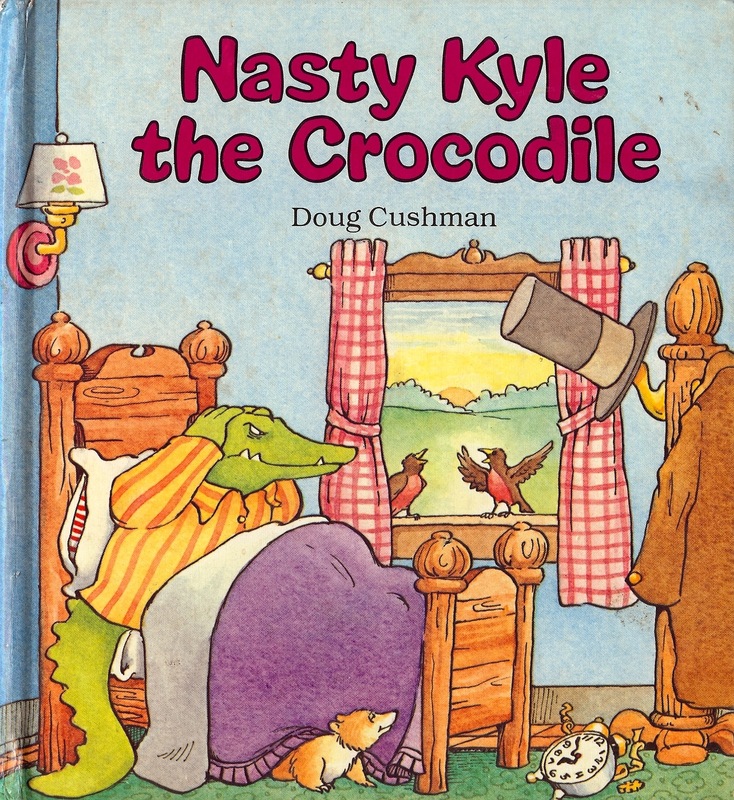 Time stood still and I dared not take a breath as Amazon compiled search results for “Nasty Kyle the Crocodile.” Up popped a somewhat poor photograph of the book’s cover, but I knew in an instant we had struck gold. There was the grumpy crocodile, greeting the morning with a grimace and a look of disgust for the birds chirping in the window. And would you believe I got it for just 55 cents from Goodwill Books?! For the next week, I madly rushed to the mail every day in anticipation of the book’s delivery. And then it came. I can’t properly describe the amazing sense of satisfaction I felt as I flipped through its pages. Here Kyle was, just as I remembered him except now bearing a name to go with my memory. 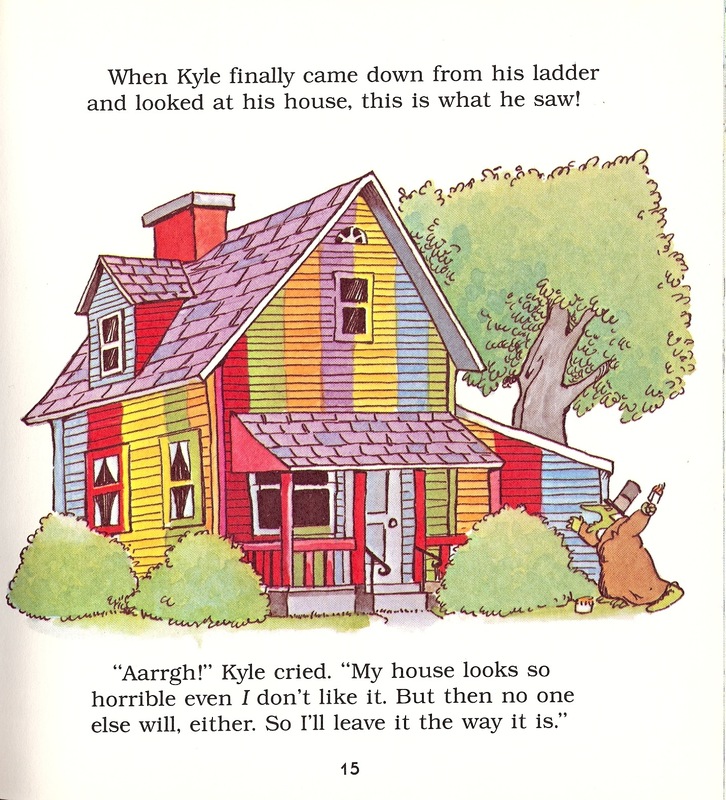 Kyle does, in fact, choose to paint his house capriciously. When Fred Goat stops by to compliment him on the blue hue he has selected, Kyle switches to red paint out of spite. But then Olivia Hippo extols her love of red, and Kyle moves on to yellow. Eventually, he’s forced to mix his buckets of primary colors to create green, orange and purple. The end result is my rainbow house, which delights the neighbors but irritates the ever-grumpy Kyle. I’m not sure my 2 1/2-year-old, Eloise, was as impressed with the book as I was as a child. But who am I kidding, most of her books are for my entertainment anyway. What a great story! It’s amazing how books from our childhoods stay with us? One of my favorites, now out of print, which I had to search for was The Camel Who Took A Walk. Another (not a picture book but still my favorite for some time) was The Horse On The Roof! Thanks for sharing this terrific story! I’m not surprised that the librarian who helped make this possible is Micki Freeny! I live in Oregon now, but I worked with Micki in metropolitan DC for years and she is an example of the kind of great service the best children’s librarians provide. Bravo Micki! I’m so happy that you found it! You found it! You found it! So happy for you! Happy Day! I’m really excited for you! I absolutely LOVE this book! You just helped me rediscover it! Morgan, this makes me SOOO happy! I thought I was the only crazy one who loved this odd book! "President Taft is Stuck in the Bath," written by Mac Barnette and illustrated by Chris Van Dusen. I love non-fiction and historical fiction picture books. The best ones make what seems like ancient history come alive for young readers. This one is based on the supposedly true story that President William Howard Taft once found himself stuck in a bath tub on account of his heft. The book's illustrations are vibrant and energetic and the text is comical. I especially appreciate the afterward that offers the historical evidence that supports the story, including the numerous oversized tubs Taft custom ordered for each of his residences. Author/illustrator Sarah Gibb's version of "Rapunzel." Gibb's illustrations, with frequent use of silhouettes, are stunning. She's drawn from the classic Brother's Grimm fairytale (rather than the modern, Disney re-imagining), which satisfies Eloise's appetite for princess stories while still giving us a story with substance. "The Story of Doctor Dolittle," written and illustrated by Hugh Lofting. She loves Lofting's illustrations of all the doctor's animals, and the chapters are packed with adventure and the perfect length to hold her attention. "If I Were an Owl," by Jellycat. She's discovered touch-and-feel books and loves them. The latest in our collection of Sterling Illustrated Classics with art by Robert Ingpen: Peter Pan by J.M Barrie. Previously, my only exposure to this classic was the T.V. movie starring Mary Martin as Peter Pan. The details of the original story are so much more magical!